The Metapace T-25 is an economic market-entry printer which offers much more for its top price than similarly priced no-name products. This direct thermal printer for 58 and 80 mm wide receipts is specially designed for the POS in small shops and boutiques, as well as in hospitality. With its robust housing and high print speed of up to 250 mm per second, it delivers reliable performance at a low initial cost. The print speed ensures that no customer needs to wait long, thus maximizing general customer satisfaction. Maximum print speed 250 mm/sec. 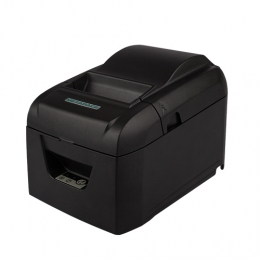 The T-25 comes with a large paper buffer capable of accommodating receipt rolls with a diameter up to 10.2 cm. The advantage is up to 67 more paper per roll compared to standard rolls. This reduces the number of paper roll changes to a minimum and shortens maintenance-based downtimes. What this also means is that customer throughput and productivity increase. The roll size additionally reduces the cost per receipt, which in turn increases net profit. The Metapace T-25 has everything that a good POS printer needs standard. An integrated auto cutter separates the receipts cleanly and partially, up to 1 million times. The print quality with 203 dpi 8 dots/mm is good enough for text, as well as graphics, images and, of course, various barcode symbologies. With an MTBF of 60 million characters the print head is well equipped for longevity. It has a life cycle of up to 100 km. The T-25 also comes standard with ESC/POS emulation and is OPOS-compatible when it leaves the factory. Integration into numerous applications is easy. Also standard is a dual interface with USB port and serial RS232 connection. As is customary with Metapace, you receive the T-25 fully equipped in a complete package. Included in the delivery are the power supply, cold device cable, USB cable and Quick Start Guide. To round out the package there is also a CD with all necessary drivers, plus a receipt roll included - so that you can begin immediately.